THE INDEPENDENT ALLIANCE is attempting to ensure that ballot papers for next year’s general election describe them and other non-party candidates as independents. At present any candidate who is not a member of a registered political party is described on a ballot paper as ‘non-party’. One source in the grouping said this did not make sense when they are universally recognised and described as independents in the Dáil and when they appear in the media. “No one ever refers to us as a ‘non-party TD’. Changing this would benefit all independents not just those who are part of the alliance,” the source said. The loose alliance of independent TDs met with lawyers in Leinster House earlier this week to assess what steps to take to change how they appear on the ballot paper. Lawyers will now examine what case can be made to have the ballot paper description changed with the possibility of High Court action not ruled out. 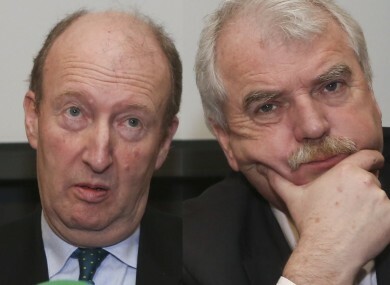 A number of high-profile TDs are involved with the Independent Alliance, including Shane Ross, Finian McGrath, Michael Fitzmaurice, John Halligan and Tom Fleming. It plans to run over 20 candidates in next year’s general election, including former Green Party TD Paul Gogarty. Email “These lads really want you to know they're independent ”. Feedback on “These lads really want you to know they're independent ”.